Buy and send roses online through Roses Only. 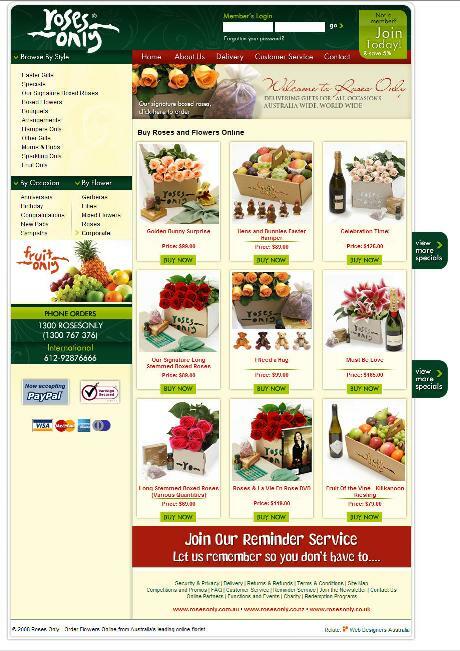 Find and order online beautiful flowers for any occasion through this florist. Roses, bouquets, flower arrangements and hampers. Australia�s leading floral retailer, we offer a wide range of exquisitely boxed long stem roses, tulips, gerberas, lilies and mixed seasonal flowers,in addition to superb floral arrangements, accompanied by fine champagne, wine, teddy bears and Lindt chocolates. Roses Only offers you the perfect gift, whether it�s for a special birthday, your anniversary, a celebration or just an �I love you� gift, our florists can create anything from a strikingly simple arrangement to a flamboyant, dramatic bouquet suited to your specific needs and budget. All our signature boxed flowers are elegantly presented in the famous Roses Only box, nestled in soft tissue paper, with a box of delicious Lindt chocolates, a small bottle of rose oil & a sachet of pot pourri. Furthermore, Roses Only can also organise for the delivery of beautiful flowers and gifts overseas! Roses Only has a presence across Australia and now delivers through out New Zealand and the United Kingdom.